Trolling for Grouper is not a common method known to many fishermen, however it is expremely productive and can also be employed when the wind is blowing hard making it rough offshore, but inside on the reef it is nearly flat. This is a great way to make what might be a "weather day" in the Bahamas very productive and fun. 1. Start with preferrably dacron or braided line, with second choice being wire, and third monofilament. Best to use 50lb test - 80lb. 2. The more flexible the rod, the better to take shock on strike and to keep from pulling hooks. 3. Use a 2lb cigar sinker for one rod and a 1.5 lb sinker for the other. Plan to fish the 2lb sinker rig closer to the boat and the 1.5lb rig further back. 4. Rig a 50' 250lb mono (trace) leader behind each sinker with a heavy duty snapp swivel. 6. Get boat to reefy bottom between 25' and 50' deep. Try to find a bottom with little variance in depth so that there are not steep differences as you want to try to keep your baits consistantly a few feet above the bottom. 8. Head boat down the edge of the reef at around 4-5 knots. Let your line out steadily applying pressure to the spool with your (glove protected) hand. Let it out quickly but not too fast until you feel the lead hit the bottom and then lock the drag up IMMEDIATELY. You should really count the seconds it takes to hit the bottom the first time so you have a good idea how long it will take the next time. 9. Troll STRAIGHT with only SLIGHT turns as you are dragging your lure only feet above the reef bottom. Any turn will allow your lead and lure to sink and probably (not possibly) hang the reef. If you do need to make a sharper turn, either reel up line or speed up the boat until you have made your turn, then go back to fishing. 10. Sometimes you may get a hit and miss the fish. In this case, jig the rod quickly to try to entice your guest to come back to the dinner table. This will work around 50% of the time. 11. When you get the fish on, DO NOT SLOW DOWN!!! If you do, Mr. Grouper will look for a hole and then wedge himself inside. Not what you want. Your angler will have to have a strong arm and a good sense of humor!! After you have pulled the fish a bit, you might be able to back the throttle to idle but STAY IN GEAR! 12. Pump and reel (giving ZERO slack) until you see the fish on or near the surface behind the boat. At this time, if needed, you can pull the boat out of gear as long as your angler will not slack the line. Sidebar: On my very first captain's job when I was 19, getting ready to fish the Bacardi Tournament in 1979, the marlin fishing was slow, so I gave my mate the wheel, and went to the pit to make up these really strange rigs (strange to everyone else on the boat anyway). My mate was from Oregon Inlet and he thought I was crazy. I gave everyone a quick course & explanation of what we were going to do. The looks I got were pretty discouraging to say the least. It was around 3:00 in the afternoon when we (I) deployed these rigs and climbed back to the bridge. It wasn't five minutes when the first rod bent over like Godzilla was on the other end! I yelled to the mate to reel up the second line quickly as my Boss Lady wasn't pulling very hard and I would need to slow down. "It's a rock" she said (repeatedly), I kept telling her it wasn't until she stopped reeling and the fish found a nice hole to wedge itself into. Then I said "NOW it's a rock!". "Keep it tight!" I shouted. "Reel as I back down for you, Keep it Tight". I had schooled my skeptical mate on what to do when he got the leader (beat the grouper's head against the rock until he gives up). This works around 60% of the time. Well, he wasn't even going to try it seems, but lucky for him, the fish felt some slack and swam out of the holw. "Hey, Hey! There's a fish on here!" he yelled. No S__t! I yelled back. Well, as we had not fought this fish, he was very green, but fortunately my mate had handled many Tuna and Marlin in his career and this 60lb Grouper was no match for him. We got the gaff in him and I yelled to the owner (especially the Boss Lady) "how do you like this ROCK?!" We caught two more Grouper in the following 45 minutes and headed to the dock where severalof my seniors (Hot Shots) were extremely curious to know how & where I caught all this meat for my owners. You are the first ones I am telling 32 years later. PS - troll our Steel Heads on flat lines or short riggers while trolling for Grouper and plan to see hits from: Yellowtail Snapper, Ceiro Mackerel, Barracuda, Jacks, Rainbow Runners and other reef dwellers. Fish this way while buring little fuel making your way from one Island to another! 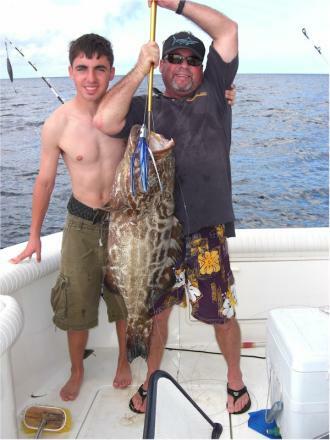 click here to go to our Grouper Lure Page.